Ken Shigley is an Atlanta-based trucking trial attorney representing clients in cases of serious personal injury and wrongful death arising from large truck crashes statewide in Georgia. Catastrophic truck crash cases are the core of our law practice. Mr. Shigley is a member of the Board of Regents of the Academy of Truck Accident Attorneys, the premiere national organization of lawyers focused exclusively on representation of injury victims in truck crash cases.Previously, he served as a board member of the American Association for Justice Trucking Litigation Group and chair of the Southeastern Motor Carrier Litigation Institute. He served in 2015-16 as chair of the American Association for Justice (AAJ) Motor Vehicle Collision, Highway & Premises Liability Section, which specialized litigation groups onTrucking Litigation, Bus Litigation,Inadequate Security Litigation,Spinal Cord Injury,Traumatic Brain Injury, Motorcycle Litigation, Bicycle Litigation, and Resort Torts Litigation. Mr. Shigley has represented individuals and families devastated in many truck crash cases involving wrongful death, traumaticbrain injury,spinal cord injury,vertebral fractures,burns and back injuries, herniated cervical discs, brokenlegs,arms, ankles,hips and and other injuries arising from truck, bus and car crashes, dangerous commercial premises and defectively designed or manufactured products. 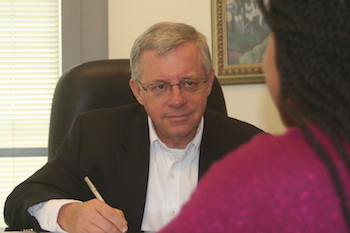 In 2011-12, Mr. Shigley was president of the 45,000-member State Bar of Georgia, which includes all attorneys and judges licensed in Georgia. That included intense work with the executive, legislative and judicial branches of state government and judges' councils in all classes and levels of the judiciary statewide, the 150-member board of governors, 16-member executive committee and staff of 75 in three State Bar offices in Atlanta, Savannah and Tifton. He also served as a member of the Special Council on Criminal Justice Reform (appointed by Governor Nathan Deal),chairman of the board of the Institute for Continuing Legal Education in Georgia, trustee of the Institute for Continuing Judicial Education in Georgia, the Commission on Continuing Lawyer Competency, the Chief Justice's Commission on Professionalism, Georgia Commission on Dispute Resolution, Georgia Courts Automation Commission, as a member of the American Bar Association House of Delegates, National Conference of Bar Presidents and Southern Conference of Bar Presidents. Previously, he was chair of the State Bar of Georgia Tort & Insurance Practice Section and the Georgia Insurance Law Institute. At the end of his term as State Bar president in 2012, the Georgia Judicial Nominating Commission included him in the "short list" of nominees submitted to the Governor to consider for appointment to the Georgia Court of Appeals. One of only 18 Georgia lawyers who have earned double board certification in Civil Trial Advocacy and Civil Pretrial Advocacy from the National Board of Legal Specialty Certification, he is also a Diplomate of the National College of Advocacy. Mr. Shigley is also the lead author of Georgia Law of Torts: Trial Preparation & Practice (Thomson Reuters West, 2010-17), which was quoted as an authority by the Supreme Court of Georgia in a 2014 case decision. Peer review ratings include an “AV” (highest) rating in theMartindale Hubbell Law Directory, “Super Lawyer” rating in Atlanta Magazine, “Legal Elite” ranking in Georgia Trend magazine, “Who’s Who in Law” listing in Atlanta Business Chronicle, and inclusion in the Bar Register or Preeminent Lawyers. For over 20 years, he has been a frequent speaker at continuing legal education programs in Georgia and across the United States. Often on the "bleeding edge" in new developments, he launched the first law firm website in the Southeast in 1996 and one of the first lawyer blogs in the Southeast in 2005. He is the State Bar representative on the Judicial Council of Georgia Technology Committee. Co-counsel in Nevada trial resulting in $6 million jury verdict for defect that led to passenger ejection in rollover. Obtained record recovery in a south Georgia county for adult children of elderly couple killed when they were rear-ended by an intermodal tractor trailer, after uncovering fact that truck driver had been on the phone for 25 minutes up until the crash with someone in Bogata, Colombia. Won $2.3 million jury verdict in Gordon County for client who suffered complex leg fracture in head on collision with truck operated for interstate motor carrier. Represented 10 of 33 members of baseball team injured in crash of team bus, with collective resolution for total of $16 million, distributed to team members according to agreed formula. Obtained confidential multiple seven figure settlement against auto manufacturer where defective design of anti-lock brake system led to fatal crash of minivan. Obtained confidential multiple seven figure settlement against manufacturer of sports utility vehicle where defective design of passenger restraint system and roof led to quadriplegia. Made joint damages presentation for group of University of West Georgia cheerleaders who recovered total of $9.3 million in crash caused by failure of tire on college van, apportioned among 13 plaintiffs on an agreed formula. Won a $1.2 million jury verdict for Atlanta woman with head and neck injuries who had been drinking and doing cocaine with the driver of car in which she was a passenger. Obtained $1.3 million settlement – $300,000 above insurance policy limits -- for the parents of teenager killed when their family minivan was rear-ended by tractor trailer at night on I-75 near Calhoun. Recovered million dollar policy limit in wrongful death case against a fly-by-night trucking company in Tennessee. Recovered $850,000 while jury was deliberating for neck injury for man struck by a dump truck in Macon. Recovered $750,000 for and airline passenger whose ankle was shattered when she was struck without warning by a motorized cart in airport terminal concourse. After graduating from Emory Law School, Mr. Shigley began his career as an Assistant District Attorney in the Tallapoosa Judicial Circuit, which then included the counties of Douglas, Haralson, Paulding and Polk. He then spent several years in small town general practice, handling a broad range of matters that included criminal defense, divorce, child custody and support, real estate, wills, probate, bankruptcy, small business formation, collections, personal injury, workers compensation, and virtually anything else that could come in the front door of a small town law office. When an Atlanta insurance defense firm made him an offer out of the blue, he spent the next decade defending lawsuits for insurance companies and state and local governments throughout Georgia.He launched his own firm at the end of 1990, and since then has focused primarily on plaintiffs’ personal injury and wrongful death cases and insurance coverage disputes. From 1995 to 2003, he served frequently as a mediator at Henning Mediation & Arbitration Service.Lawyers and judges have also retained him to represent them in their personal and professional legal matters. A graduate of Furman University and Emory University Law School (where he has been an adjunct instructor in trial techniques and small firm practice), he also completed the "Ultimate Trial Advocacy" course at Harvard Law School and an executive education program at Harvard Kennedy School of Government and several regional programs of the Gerry Spence Trial Lawyers College. Ken was married almost 34 years until his wife, Sally, succumbed to a 29-year battle with recurring brain tumors in June 2017. Their adult children are Anne Shigley Noble, an elementary special education paraprofessional in New Hampshire, and Ken Shigley, Jr., who has a fitness training business in Atlanta. Anne's husband, Steve Noble, is a telecommunications engineer on the staff of Dartmouth College. Mr. Shigley is currently a trustee of The Peachtree Trust. He has served as an elder at Peachtree Presbyterian Church, YMCA youth soccer coach, assistant scoutmaster of the Boy Scout troop where his son became an Eagle Scout, board chair of a church-based child development center, Secretary of the Bill Maness Good Samaritan Scholarship Fund, Inc.,board member of Lifegate Christian counseling center, and on the national advisory board of the Children's Tumor Foundation Endurance Team. In his spare time, he has completed marathons and triathlons, and enjoys backpacking, kayaking, biking and travel.